The East Terrace: A plan that backfired? The East Terrace: Referees to bite back? "Has anything happened at any point in the build up to this try, in the play before this try - in fact, at any point during the game at all - where a player, or players, from the attacking team has engaged in foul play or has technically infringed in anyway whatsoever, which would have had any impact, however small, on the game and contributed to the situation from which we just saw a possible try being scored? "Furthermore, if you do find any player, or players, from the attacking side that has infringed in any way, whether technically or by foul means, can you check if that attacking player, or players, was not incited to do so by the illegal actions of any player, or players, from the defending side? If that was the case can you then check that the offending defending player, or players, was not previously offended against by any attacking player, or players? Take your time." In an even more shocking move, the IRB also announced that for games in which no television cameras are present, the referee will consider footage from spectators' mobile phones. The referee will also be permitted to ask a similar question when judging whether to allow drop goals, penalties or conversions. In practice, referees are expected to ask this question every single time a try is scored as these days they are too afraid to make any decisions about anything. "We think this solution is in the best interest of the game," continued Lyons. "We want to be fair and ensure that no try, penalty, conversion or drop goal is ever scored that has any unfairness or controversy surrounding it. Anyone who has supported the extension of the TMO powers in recent years would be a hypocrite to contest the implementation of our new laws. "Take this theoretical example: Team A makes a 50-yard break due to an illegal block by a player off the ball. Furthermore, a forward pass is then made leading to another ten yards being gained. The referee misses both these infringements and at the end of the play Team A gets awarded a five-metre scrum. 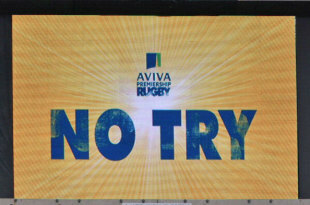 From the next play Team A score a pushover try. "Team A were only in a position to score that try due to the match official missing the infringements in the previous play. That's just as unfair as the referee missing an infringement in the play directly leading to a score. So why shouldn't that be reviewed? Anyone who agreed with the extension of TMO powers at the start of the English Premiership has to, by default, agree with our new laws. Case closed." "We would encourage every rugby fan and official to constantly film the games they are watching," said Lyons. "We want fairness and we want to ensure the correct decision is always made when it comes to legitimate tries. So why not utilise the technology offered by smartphones? It's there and we should use it. "It isn't fair to see players participating in games in which there is no live match coverage missing out on the wonders of TMO. The only difference here is the match official will also serve as TMO. Fans and officials, if they think they have a case, should simply call politely from the sideline and ask to enter the field of play and show the referee their videos." If the new laws prove to be a success, which the IRB are confident they will be, there are plans to extend the powers even further next year and allow referees to check into the moral character of players to ensure tries are not awarded to 'bad eggs'. "Life may not be fair," added Lyons. "But there is no reason rugby cannot be."